1. Get your camp fire to a point where there are plenty of hot coals in the pit. 2. Place two chickens in large stock pot. Add salt and sugar then fill pot with water to cover chickens. Let chicken sit in brine for at least 4 hours or overnight. (Refrigerate if letting sit overnight). 3. Truss your chickens (see video if you've never done this before) and skewer the chickens firmly onto the rotisserie spit over your campfire. 4. Combine apple cider vinegar, brown sugar, white pepper and water or beer in a squirt bottle. Douse chicken with this mixture. 5. Rotate spit every 20-30 mins (10-15 if your fire is roaring). Add wood to the fire as needed to keep fire nice and hot but don't let flames touch the meat. Douse chickens once an hour with brown sugar and vinegar mixture. 6. Cook chickens for 4-8 hours depending on how hot your fire is. Chicken is done when thickest part of bird is 175˚. Let meat rest for 20 minutes before carving. Top with barbecue sauce and serve. 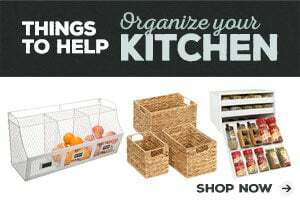 Get ready for camping season! Or glamping season. Whatever your preference, I won’t judge. I’m all about the air mattress, myself. Or better yet, an air conditioned cabin and hot showers. But that’s just me. See, my favorite part about camping is the food! This little campfire chicken experiment actually happened in our backyard. We don’t get to go camping as much these days with our two young ones and two full time jobs, so we just sort of turned our backyard into a campsite. Hey, if you ignore the fact that there is laundry inside the house, it’s almost like we’re on vacation. Kinda. Anyway, point is, you can cook chicken over a campfire any where. Whether you’re actually camping, or “camping” in your backyard. How do you cook chicken on a campfire? You can smoke a chicken over a campfire, you just need a rotisserie style set up. We actually built our own rotisserie and by we I mean the Mr. There were some 4x4s lying around from the garden bed we had just dug up which made a perfect pair of stanchions for the spit. He cut two pieces, each 36″ tall then drilled holes towards the top, big enough for the spit to go through. After that, he secured the boards along the bottom with a scrap piece of metal he had but said they were just for added measure and that you could probably get away with not doing that. The 4x4s were placed on either side of the firepit, far enough away from the fire itself of course, and we used the loose stones from our firepit to secure them in place. The actual spit he got from his sister who had it from an old grill. What tools do you need to cook chicken over a campfire? 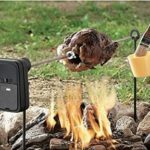 If you’re not wanting to go to all that trouble, or would just find it easier to buy a spit, check out this Grizzly Spit Rotisserie that has great reviews and an electric rotator. A few notes from the mister: The chickens should be about 30″ above your hot fire. Smoke is good and heat is good, flames are bad! Don’t let the flames touch your chicken. For an added bonus throw some whole, husk-on, sweet corn into the hot embers while you let the meat rest. They should cook in about 5 minutes and ideally you’ll want to dip them in water first. Corn and chicken make a complete meal when you’re camping… and all this washes down nicely with our famous camping sangria. For more camping recipes, check out my camping food Pinterest board.